The Best AE M-Mount Film Camera Ever Made Wasn’t Made By Leica. It’s Made By Konica. The Hexar RF, released by Konica to much ‘controversy’ amongst Leicaphiles in 1999, represents a path of technological sophistication in 35mm rangefinder camera design that Leica chose up to that time to avoid, either through inertia or, as then claimed, because of Leica’s traditional design philosophy which emphasized simplicity of design and practice as a guiding principle. The Hexar is the most advanced M-mount film camera ever produced, incorporating the then latest technologies found in high end Nikon and Canon professional reflex cameras. This at a time when Leica was happily producing the manual exposure, manual wind-on and rewind M6, essentially a camera with the same design as the then 45 year old M3. In 1999, if you wanted a rangefinder and your aim was operational savvy, as opposed to a fixation on mechanical purity, the Hexar was your obvious choice – a technologically sophisticated auto exposure camera that accommodated your Leica lenses. To this day, the Hexar RF is the only M-mount rangefinder camera with automated film advance and rewind. It has the fastest shutter of all M-mount rangefinder film cameras, 1/4000 sec. It features an AE lock position on the shutter speed dial, a metered manual shutter mode besides the auto-exposure mode, DX code reading (later introduced by Leica with the M7), and an LCD panel that showed battery status as well as the frame counter. The Hexar viewfinder, while not quite as bright as the M6’s, accommodates the same 28-35-50-75-90-135mm frameline set of all Leicas from the M4-P onwards. With a magnification of 0.6x as opposed to the standard 0.72x of the M6 and M7, the Hexar made a compelling case for folks who typically shot wider angle optics in the traditional rangefinder fashion but wanted Leica to move into the 21st century. The Hexar was incendiary stuff for hard-core Leicaphiles, producing years of convoluted mental gymnastics from the faithful attempting to rationalize why the Hexar just wasn’t up to Leica snuff: to wit, It didn’t have the “tactile” feel and pleasure of a manual Leica; the electronic shutter was too loud and not good enough for “discreet” shooting; it was too battery dependent; and aesthetically, it looked too boxy, too much like an updated M5. In short, it hadn’t been sprinkled with the magic Leica Fairy dust. 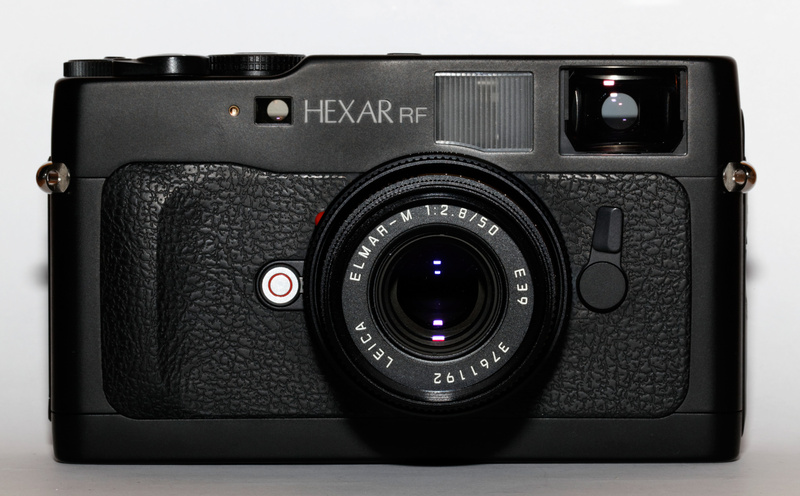 All of that aside, what really killed the Hexar RF as a viable alternative to the M7 (which Leica brought out in 2002 partly as a response to the Hexar) was that–according to shadowy figures making nebulous claims never really backed up with hard facts–there existed a slight difference in film flange distance between the Hexar body and a Leica M, thereby making the Hexar incompatible with M-mount lenses not specifically made by Konica for the Hexar. Where this rumor started is lost in the mists of history, although some speculate it was first floated by Leica to discourage people purchasing the Hexar as an alternative to the M. Others have surmised that it was started by Konica as a way to sell their lenses (Konica produced a number of stellar M mount optics for use with the Hexar, a 28mm 2.8, a 50mm 2, and a 90mm 2.8 M-Hexanon) which, at that time, had the undeserved reputation as being inferior to Leica’s offerings (ironic, in that today the M-Hexanons are rightly considered to be the equal of Leica’s, with used prices to match). Prices for used Hexar Rf bodies are ridiculously cheap these days, making it one of the great bargains for an M-mount camera. Consider as well that most used bodies will have been sparingly used, in that Hexar bodies, coming as they did on the cusp of the digital transition, were never much subjected to long hard use. This entry was posted in Uncategorized and tagged Konica Hexar Rf on August 29, 2015 by Leicaphila.